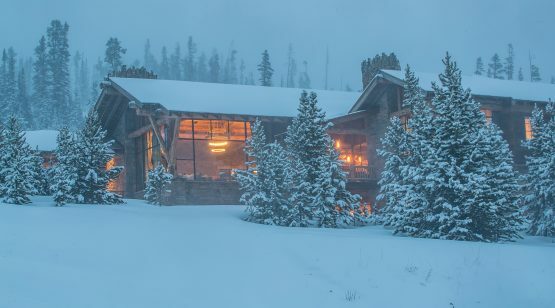 The Pine Ridge neighborhood of the Yellowstone Club is true mountain living, with homes tucked into treed corners at lofty elevations. 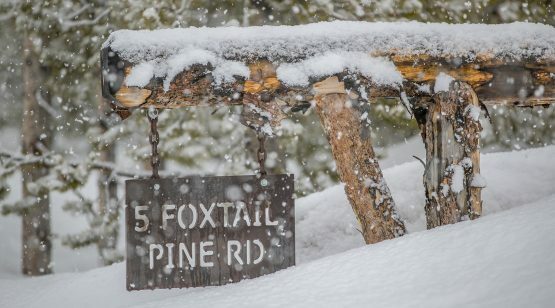 This is a neighborhood where the hustle of daily life slows to a friendly pace; where humans respect and give room to the original, animal inhabitants; and where lodgepole pines collect blankets of snow all winter long. 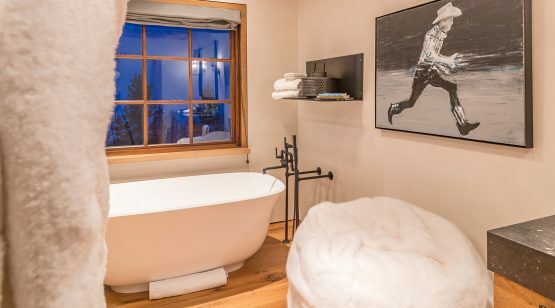 It’s the perfect corner from which to enjoy all the Club has to offer, including ski-in/ski-out access to both Pioneer Mountain and adjacent Big Sky Resort. 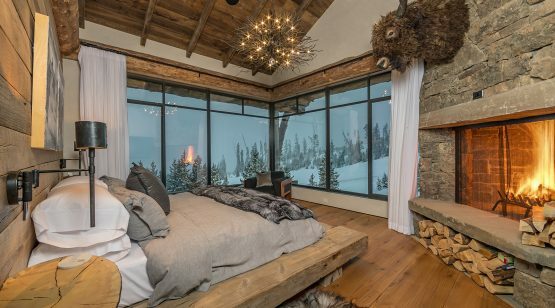 Pine Ridge 321 is a custom residence expertly designed by locally-renowned architects Pearson Design Group, loved for their ability to express the mountain vernacular in an approachable, livable style. 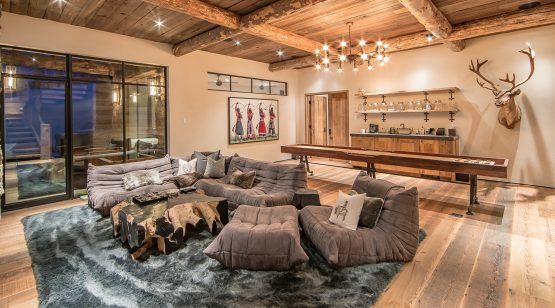 This home features ample living space across two levels. 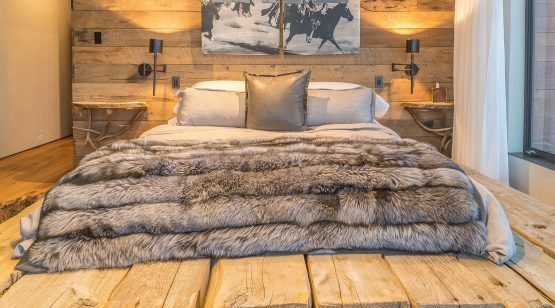 The home’s design speaks to an updated, playful camp-house styling with an industrial edge: Crisp wood and metal details evoke a Scandinavian feel, while plush pillows, wood-wrapped walls, and cozy throws soften the edges and create an inviting ambiance. 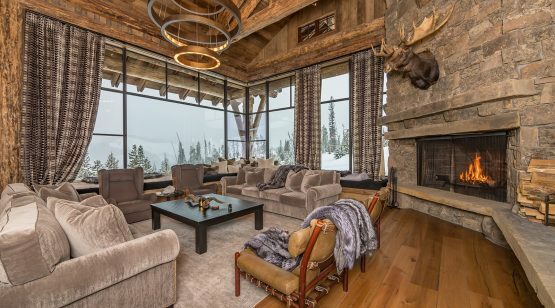 Picture the perfect ski day—uncrowded turns of airy power and unlimited Rocky Mountain views—and now picture coming home to the perfect hangout. 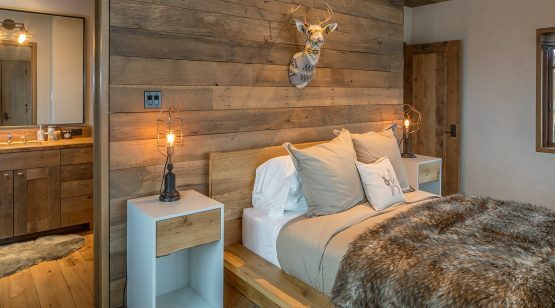 Pine Ridge 321 has these details covered: walk through the ski room to tuck away all of the ski gear, then step through a hallway to the après-ski lounge, where a crackling fire awaits and a fully-stocked bar mimics the feel of the much-loved YC Sugar Shacks. 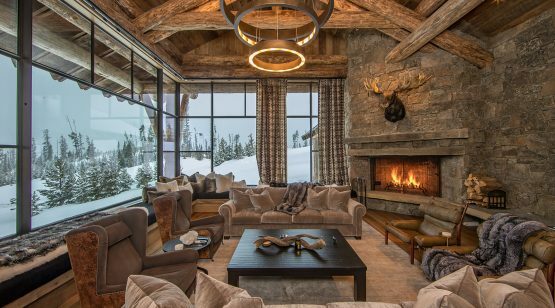 This corner of the home is the perfect spot to unwind, warm up, and soak in the mountain scenery. 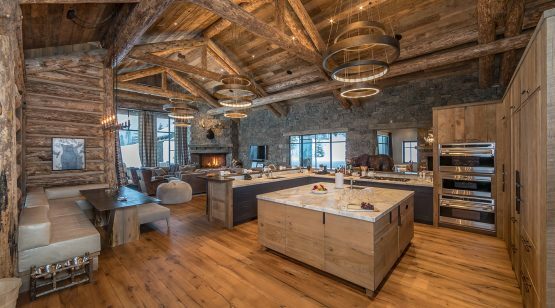 In addition to offering a sanctuary for skiers, the home’s main level features other gathering spots, including the great room and its huge stone fireplace, the incredible kitchen, and two bedroom suites. 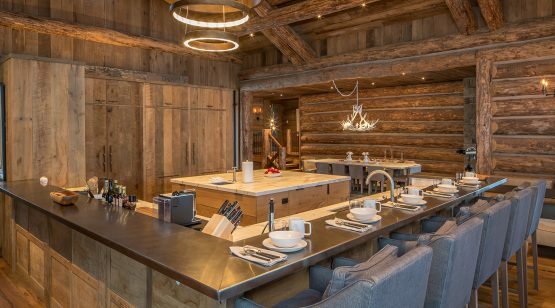 The kitchen is deceptively spartan: weathered wood walls hide appliances and ample storage, revealing every modern convenience and countless subtle details. 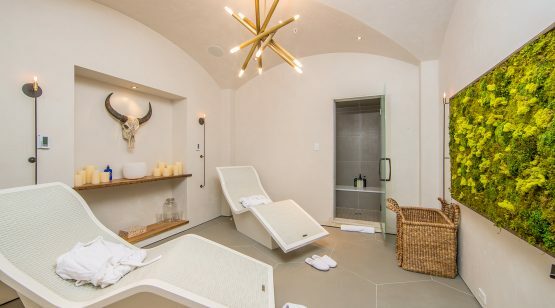 This space is crisp, clean, and inspiring. 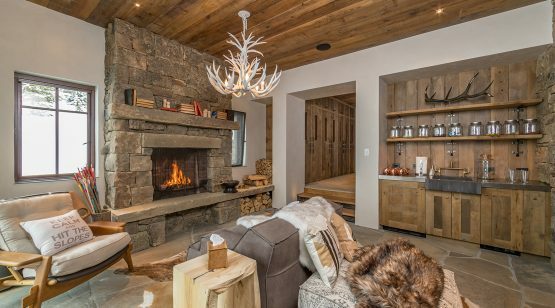 The master suite enjoys its own corner fireplace, industrial-style windows, sparkling chandelier, and a custom, rough-milled bed frame. 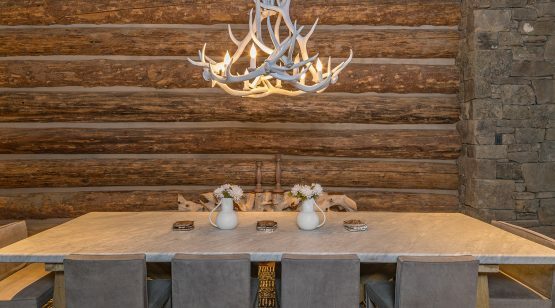 The unique touches don’t stop on the home’s lower level. 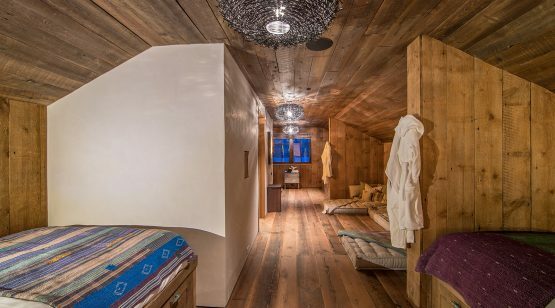 Here, an additional bedroom suite and bunk room offer spacious accommodations, while the informal gathering spaces create a lively atmosphere. 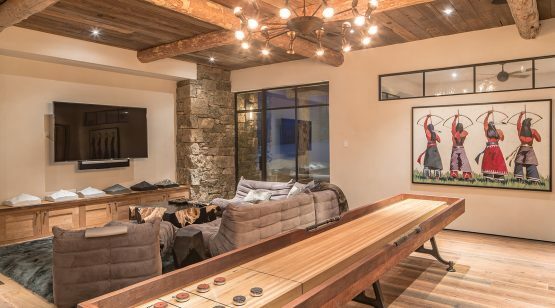 The lower level features all-ages gaming options in the rec room, plus bar area, home gym, custom spa, and steam room. 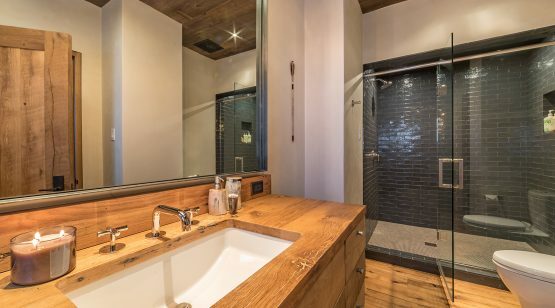 This home is truly its own private retreat! 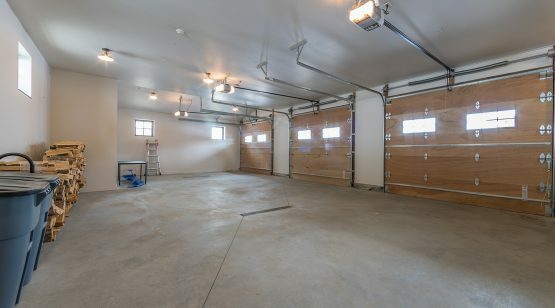 With the addition of the above-garage loft, this home easily sleeps 13 or more people, making this the perfect setting for getaways of friends and family. 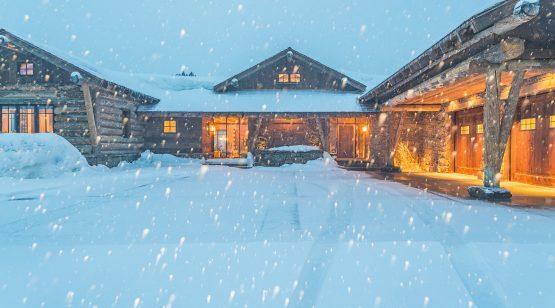 And with the bountiful Club amenities just a short drive away, this custom residence is sure to become the favorite destination.